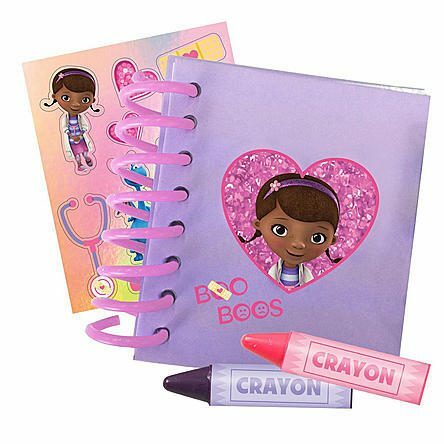 Disney Doc McStuffins Big Book of Boo Boos Just $2.99 Down From $7.99 At Sears! You are here: Home / Great Deals / Disney Doc McStuffins Big Book of Boo Boos Just $2.99 Down From $7.99 At Sears! Sears has this Disney Doc McStuffins Big Book of Boo Boos on sale for $2.99 (Reg. $7.99)! Disney Junior Doc McStuffins, doctor to stuffed animals and toys, uses her Big Book of Boo Boo’s to record all her expert diagnoses! The set includes a spiral hard cover notebook with sparkly details, wipe off pages, notebook paper, 2 dry erase crayons and shiny sticker sheet to decorate your book. The Doc Is In!